—the ant philosophy. I think everybody should study ants. 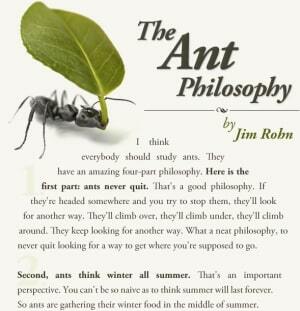 They have an amazing four-part philosophy, and here is the first part: ants never quit. That's a good philosophy. If they're headed somewhere and you try to stop them, they'll look for another way. They'll climb over, they'll climb under, they'll climb around. They keep looking for another way. What a neat philosophy, to never quit looking for a way to get where you're supposed to go. Second, ants think winter all summer. That's an important perspective. You can't be so naive as to think summer will last forever. So ants gather their winter food in the middle of summer. An ancient story says, "Don't build your house on the sand in the summer." Why do we need that advice? Because it is important to think ahead. In the summer, you've got to think storm. You've got to think rocks as you enjoy the sand and sun. The third part of the ant philosophy is that ants think summer all winter. That is so important. During the winter, ants remind themselves, "This won't last long; we'll soon be out of here." And the first warm day, the ants are out. If it turns cold again, they'll dive back down, but then they come out the first warm day. They can't wait to get out. And here's the last part of the ant philosophy. How much will an ant gather during the summer to prepare for the winter? All he possibly can. What an incredible philosophy, the "all-you-possibly-can" philosophy.